The purpose of quality assurance processes is to improve practice and the quality of the service we provide, with the intention of improving outcomes for children and young people through a process of continuous learning. It provides senior management with assurance as to the quality of our work. The auditing of practice is an integral part of quality assurance systems. As part of the overall Quality Assurance Framework, this Audit Framework sets out how Lancashire County Council can improve practice through audits. To achieve this, a range of audit activity is undertaken, which considers both quantitative and qualitative information. Quantitative audits focus on compliance and consist, for example, of basic counting of ticks in the right places, papers in the right files, signatures in the right place and timescales met. Qualitative audits provide a detailed analysis of files, and judgements on overall quality and content. Case file audit is integrated into daily practice as a meaningful and useful method for case file review and which supports supervision, professional development and continuous improvement. Identify potential areas of decline as early as possible. The collation of both qualitative and quantitative data and information from all audits will be analysed with recommendations for practice improvement / development, across Lancashire but also importantly broken down into the three localities. This Audit Framework sets an ambitious target for individual audits of cases. The aim is to audit at least 600 case audits (Tier 2) a year, representing approximately 8% of the total caseload. Thematic Audits – led by the Audit Team. Thematic audits will be agreed by Children Service's Senior Management Team and the Locality Practice Improvement Meetings. Tier 1 Audits will be completed by the Audit Team. Tier 1 Audits form part of the Quality Assurance Framework and are guided by service needs, outcomes of Tier 2 Audits and management direction. These audits will address quantitative issues, reviews of files, data and performance and test statutory compliance. The outcome of Tier 1 Audits will form part of the learning and be contained in the reports to the monthly Locality Practice Improvement Meetings. Tier 2 Audits consist of an audit of the case on LCS alongside an interview with the Social Worker. (The manager may also choose to attend or may be considered necessary dependant on issues identified in the audit). The purpose of this meeting is twofold. Firstly, it is an opportunity for the worker to have an input into the audit and fill any gaps in information. Secondly, it can be used to support learning through discussing good practice linked to individual cases. It should be constructive and feedback on areas of good practice as well as areas where there is a need for improvement. A 10% sample of audits will include contact with the family. The focus will be to improve learning and ensure that the views of the family are captured. Senior Managers – (There are 8 Senior Managers). Senior Managers will complete one Tier 2 Audit per month, including a meeting with the Social Worker and manager. Senior Managers will not audit cases within their own locality. Tier 2 Audits are completed using two specific audit tools: Child Protection/Children in Need (Appendix 1: Tier 2 Audit Process Flowchart) and Looked After Children/Care Leavers (Appendix 2: Tier 2 (Full) Case File Audit Toolkit (CIN and CP) Case File Grading (Ofsted Key Judgements)). The audit tools are very similar but cover separate components linked to legislation and statutory guidance. They also include details of the Ofsted gradings which should be used for consistency of grading. The Director of Children's Services and the Heads of Service will lead on one Tier 3 Audit each per month using the audit tool attached in Appendix 3: Tier 2 (Full) Case File Audit Toolkit (CLA and Leaving Care) Case File Grading (Ofsted Key Judgements), which is completed by the Audit team prior to the face to face meeting with the social worker. This will contain a case summary and cover compliance and quality of practice. This will be used as the basis for a discussion on the case. The case discussion will be led by the DCS or the Head of Service. The purpose is to ensure that senior managers are part of the auditing process and have a line of sight to front-line practice. Social Workers benefit from having one to one discussions with senior management and get an opportunity to raise issues in a constructive setting. The minutes and actions from the meeting are fed back into the continuous learning loop through the Audit Team. The Audit Team, Advanced Practitioners and Senior Managers will undertake thematic audits or case sampling. Thematic audits are undertaken to assess quality of work in specific areas, which may be identified as a result of the Tier 2 auditing or through other learning, including serious case reviews, management concerns, complaints, performance monitoring and general service user feedback. This is in addition to the LSCB led multi-agency thematic audits. Case sampling may be undertaken where a concern is highlighted in Tier 2 auditing to sample audit a larger number of cases to establish if a particular practice issue is more widespread. The outcomes and actions from thematic audits and case sampling will be fed into the reports to the Locality Practice Improvement Meetings. Auditing of case files will include children and young people who are open to CSC services, and will involve a random selection of open cases across the continuum of need: referral, child and family assessments; children In need; child protection; looked after children and leaving care. Bespoke audits will also cover other linked services including, fostering, adoption, YOT, YPS and children centres. Tier 1 Audits will be undertaken as the need arises. Tier 2 Audits will be completed on a monthly basis. When fully implemented 60 managers/Advanced practitioners will be completing 50 audits per month (allowing for leave and sickness absence) which equates to 600 audits over the year. As of April 2016 this equates to approximately 8% of open cases (7,445). Tier 2 Audits will be completed proportionate to the number of cases under the categories: child in need, child protection, and child looked after. The number of audits undertaken in each locality will also be proportionate to the number of cases held in each locality. The Audit Framework will be launched on the 13 May 2016 when 30 managers will be trained in the audit process and Tier 2 Audit tools. A further training session is scheduled for the 18 May 2016, followed by a second tranche of training in June 2016. This incremental approach to implementation will ensure that the Audit Framework is properly embedded. The Audit Team will undertake follow-up sessions with managers within the three localities to ensure confidence in the use of the tools and consistency in their application. A sample of audits will also be quality assured to check that gradings are appropriate. Full implementation of Tier 2 auditing will be achieved by July 2016. To support managers undertaking audits a guide, "Quality Assurance: What does 'good' look like?" (Appendix 3: Tier 2 (Full) Case File Audit Toolkit (CLA and Leaving Care) Case File Grading (Ofsted Key Judgements)) has been developed based on the CSC Practice Standards (Appendix 4). This should be used as part of the auditing process, alongside knowledge and judgement and will help auditors measure against good practice standards. Where the Auditor is required to meet or talk to the family, ensure that they understand the purpose of the discussion, keep it brief, clear and focused on learning. It has been agreed that Lancashire will use the same audit tool as Blackburn with Darwen. The aim is to look at peer auditing across the local authorities in the future. Files are graded based on the Ofsted Grading's – Outstanding, Good, Requires Improvement and Inadequate. The indicators for a good grading for reference, are included in the Audit Tool. The Tier 2 audit process is aligned to the monthly performance cycle, which sets out the days on each month that information is provided, validated and presented to the Practice Improvement Meetings and Improvement Board. In summary, cases will be randomly selected for audit by the Audit Team and sent to managers on the first working day of the month (Day 1). Audits must be completed and returned to the Audit Team 5 working days before the end of each month. The Audit Team will maintain a database to track completed audits and all audit action plans which must be signed off by the supervising manager for the case. A monthly summary report will be prepared for the Practice Improvement Meetings and Children's Social Care, Senior Management Team at the beginning of each month (by Day 5). This will include details of audit action plans to ensure they are tracked and signed off following completion. A quarterly report will be submitted to the Senior Leadership Team. 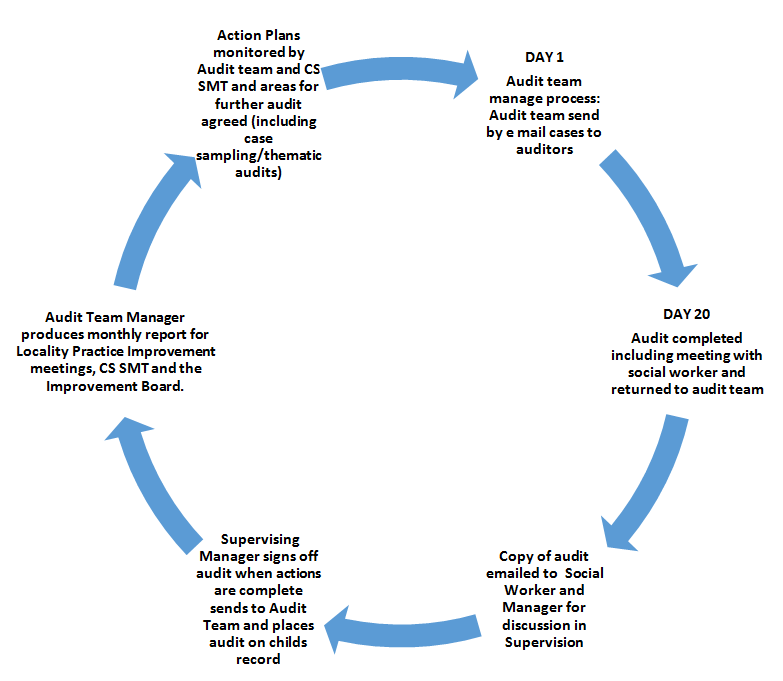 Please see Appendix 5: Monthly Audit Cycle. The primary use of the intelligence gathered from auditing is to find out how practice across the organisation can improve. Audit outlines: what is good about practice; where there is good practice and how this can be expanded into different areas; where there are concerns around quality of work and what should be done to put this right. It is not just about the individual file, but is about making bigger changes that stand in the way of good practice. To achieve this there needs to be a circle of continuous improvement. The information from audit is shared at all levels and overall findings are reported monthly to the three locality Practice Improvement Meetings. Quarterly Quality Assurance reports will be submitted to the Senior Leadership Group, including the themes from audit and the action taken to address any identified issues. The role of the Locality Practice Improvement Meetings is to oversee performance and bring together quantitative and qualitative information by triangulating performance data with the learning from case file audits to gain a better understanding of the quality of practice and the impact of services in improving outcomes for children and young people. The meetings will identify good practice as well as key areas for improvement and will ensure remedial action is taken to address issues arising from case file audits. Monthly meetings are held in each of the three localities. The newly developed Advanced Practitioner posts have a pivotal role in ensuring that audit findings are communicated and understood at both an individual case level and more broadly in developing good practice across Children's Social Care. To provide support to operational teams with the implementation of policies and procedures.